And of course, Robert Englund makes an appearance. Alexandre Aja, the visionary director behind High Tension, is used to dabbling with new filmmaking technology. With 2010's Piranha 3D, he delivered one of the first post-converted 3D films (meaning it was shot with normal 2D cameras) that actually looked great. (It's also a ton of fun, to boot.) Now he's diving into virtual reality with Campfire Creepers, a horror series that premiered at the Tribeca Film Festival last week. It's a co-production between Oculus, Future Lighthouse and Dark Corner, and you can check it out today on Dark Corner's Gear VR and Oculus apps. With Campfire Creepers, Aja and his co-creators, Casey Cooper Johnson and Martin Andersen, are aiming to recreate the thrills of horror anthologies like Creepshow and Tales from the Crypt. 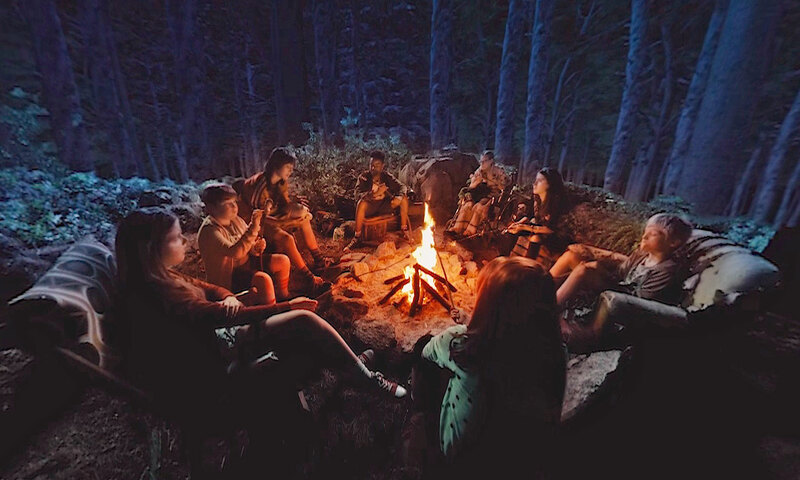 And since it centers on a group of young kids telling stories in the middle of the woods, it also evokes the classic Nickelodeon series, Are You Afraid of the Dark? Except, of course, it's a lot more violent. In an interview with Engadget, Aja says he was excited to experiment with horror in VR, since it allowed him to break free of cinematic conventions. At the same time, he was intrigued by the possibilities of using classic horror tropes in 360-degree video. "I think a lot of filmmakers were thinking about VR before it really existed. We were more waiting for it to be real," Aja said. "[Kathryn Bigelow's] Strange Days, it's the best use of VR... just the way it's shot [in first-person], the experience of running around in the beginning, and jumping from a window. I've always been very interested in all kinds of immersive storytelling." The two episodes of Campfire Creepers, The Skull of Sam and Midnight March, are each very distinct experiences. In the first, you step into the shoes of a camp counselor who's been captured by a psychopath (played by Robert Englund). Eventually, you find yourself buried neck-deep in a forest, surrounded by the rotting skulls of other victims. It's a purely claustrophobic experience, one heightened by the fact that you're wearing a VR headset. You're forced to watch a friend get killed right in front of you by an army of carnivorous ants. And you can take a wild guess how things end up for you. The second episode is more of a classic campfire tale, one where a bullied child transforms into something monstrous. Scope-wise, it's almost the complete opposite of Skull of Sam. Instead of feeling trapped in a single space, we follow kids running through a huge forest, where there doom could be hiding behind any tree. At one point, the camera sits still while the monster stalks his prey all around you. It's a perfect VR moment, thanks to the immersion of 360-degree video and positional surround sound. "What I realized making Piranha was the technology was not the key to 3D immersion, it was really the storytelling," Aja said. "And then if the technology is there, it just opens that experience." Click here to read all the news from Tribeca Film Festival 2018!